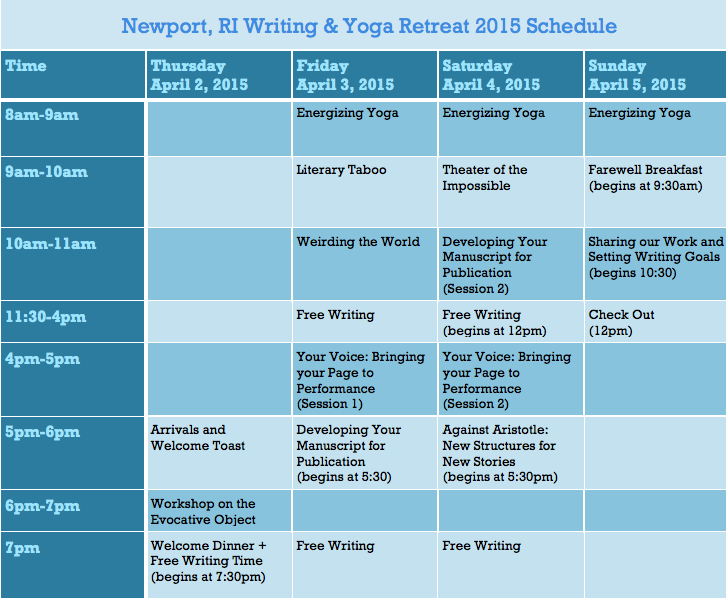 Join the Cambridge Writers’ Workshop in Newport, Rhode Island for the opportunity to take these exciting classes taught by award-winning authors and editors. The 4-day retreat will allow participants to hone their craft and writing skills in fiction, poetry, non-fiction, screenwriting and playwriting. Registration for the retreat ends on March 15, so apply while seats are still available. Please choose only one project to work with, and bring all necessary materials. Plan to dedicate yourself fully to your writing project during the retreat. This course will look at beginnings, transitions, and choices of endings. We’ll discuss the many publication options, but if your manuscript isn’t ready for that yet, don’t worry. My goal is to help each of you shape your manuscript to the best of your ability. The classes offer encouragement, support and yes, the gentlest of pushes. We’ll work with the positive energy of the group to support you in your writing goals. The script is not a flat work of literature, not a description in poetry of another world, but is in itself another world passing before you in time and space. Language is only one part of this world. The rest is space. And before we populate this space, we must create it. From “Exit, pursued by a bear” to today, part of the joy of live performance has been in watching the difficult, the unlikely and the unstageable become staged. Instead of thinking of a play or script as a blueprint for a realist performance, this class encourages you to think of it as a challenge for potential collaborators. A problem to be solved instead of a recipe to be followed. In this class, we will explore the tension between imagination and execution in order to answer one of the central questions of playwriting: how do we create spectacle and what’s the purpose in doing so anyway? For over two millennia, Aristotelian structure has dominated the Western sense of story. Protasis, epitasis, and catastrophe. Over and over. The same structures breeding the same stories. In this class, we’ll first look at what makes Aristotle’s ideas so seductive before investigating alternative ways of imagining and telling story. From collage/assembly to circular structure to devising, we’ll study new forms of a very old practice. This entry was tagged Creative Writing, Diana Norma Szokolyai, Elissa Lewis, fiction, Kathleen Spivack, Newport, nonfiction, poetry, retreat, Rita Banerjee, Screenwriting, Stephen Aubrey. Bookmark the permalink.